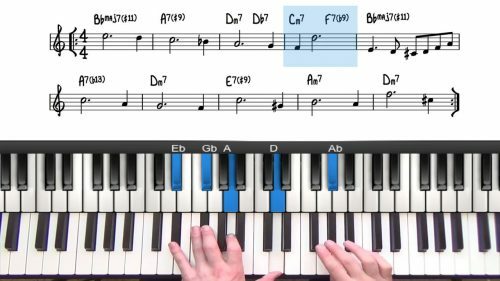 In part 2 of this tutorial we will now begin to build a full solo piano arrangement. We will examine the minor line cliche in the A Sections and then explore and discuss the use of sus chords in the bridge of the tune. The sus to altered dominant movement is a very useful device to add more harmonic interest and movement to any 251 progression. The harmony is challenging in this tune and so I would recommend practicing slowly with a metronome and focusing on accuracy. Spend some time to study the sus movement in the bridge as it’s a very useful technique to add harmonic interest over 251s. The Bill Evans recordings of this tune are definitely worth checking out. He plays the tune with such depth and maturity and there is a lot of emotion in his playing.